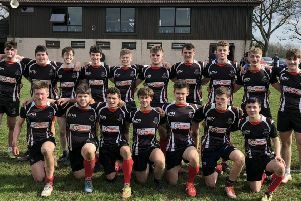 Glenrothes’ second string ran in seven tries to win 37-17 over nearest rivals Kirkcaldy in a friendly at Carleton Park. The home side opened the scoring when Lee Gartshore crashed over the line after Scott Morrison was stopped short after a pick and drive forward from a five metre scrum. Kirkcaldy struck back straight from the restart when Glenrothes fumbled the kick near the left touch line, leading to a counter down the line before touching down under the posts. The conversion took them into a two-point advantage. Russell Grieve restored the Glens’ lead when he reacted to quickest to pounce on a loose ball before try number three arrived for the home side as Gavin Denholm received the ball five metres from the line and powered his way over to score against his former club. The best try of the evening came next as Glenrothes had an attack down the right wing halted but the ball zipped along the back line to the other side of the pitch and Connor Young squeezed in close to the left corner flag. A Kirkcaldy attack gave the Glens their fifth and final try of the half as Kain Duguid intercepted a pass in his own 22m area and sprinted the length of the pitch to give a half time score of 25-7. Both sides had brought large squads and were rotating players throughout the game. Gavin Emerson was pleased to be at number 8 early in the second session when the Red pack won a scrum against the head on their guests 22m line and shoved the scrum the remaining distance to the goal line where the big man had the simplest of tasks to touch down to the left of the posts. Duguid had taken over kicking duties and slotted the only successful conversion attempt of the game for Glenrothes. At other end, a series of pick and drives close to the left corner flag eventually earned Kirkcaldy their second try. Calum May grabbed the Glens final try when the stocky centre sprinted up the wing and touched down in the corner. The final action of the game saw another series of Kirkcaldy pick and drives culminating in another try in the left corner to give a final score of 37-17. The 1st XV meet Dunfermline at Carleton Park on Friday evening, keen to reverse their narrow defeat earlier in the league programme, in what looks increasingly like a battle for the league’s runners up place. The 2nd XV face the same opponents’ second string at McKane Park on Saturday.